Open 4:00 am- 12:00 pm and 4:00 pm - 8:00 pm. 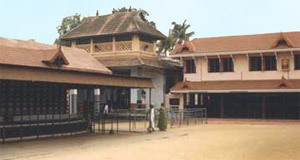 Chottanikkara Bhagavathy Temple is one of the most celebrated Hindu shrines of Kerala. The temple is located in Chottanikkara town, 17kms away from Ernakulam. Rajarajeswari (Adiparasakthi) alias Durga Bhagavathy - the mother Goddess, is the presiding deity of the temple. It is said that this deity was brought from Mookambika Temple in Kollur, Karnataka and therefore there is a presence of Mookambika (Saraswathy) Devi till 7am in the morning. The 'Devi' in the temple is known for the healing powers, particularly relating to mental illness and disorders. The temple situated in a hilly region, is surrounded on all sides by green farms. The entry is through the west and the spiritual atmosphere in the temple gives mental peace and harmony to devotees. In the main temple, the golden hued idol of Bhagavathy 4 to 5 ft. high, is bedecked with flowers, garlands, jewels and bathed in myriad of lights splendidly. The idol has four arms. The upper right holds the disc, the upper left bears the conch, the lower right hand is held in a boon-conferring pose and the lower left indicates the abhaya (fearlessness) pose. The Bhagavathy is worshipped in three different forms as Saraswathy in the morning clothed in an impeccable white garment, Lakshmi at noon with crimson red cloth and Durga in the evening wearing a bright blue dress. Durga is a much milder form. The original idol of Bhagavathy, three or four feet high which faces east, is of laterite and is believed to be self-born (swayambhoo). This image called 'Rudraksha Sila' is irregular in shape, red in colour and is untouched by the human sculptor. This image can be seen only in the wee hours of morning at 4 am when the Nada opens for nirmalyam. Adjacent to the image of Bhagavathy, to her right, there is an image of Mahavishnu in granite on the same pedestal. Vishnu and Bhagavathy together are referred to as Lakshminarayana. The deity is also called Ammenarayana, Devinarayana and Bhadrenarayana. Along with Lakshmi and Narayana there are idols of Brahma, Siva, Ganapathi (Ganesh), Subramanya and Sastha on the same pedestal. The idol of the deity in the temple is not fixed to the ground. Hence the area around the pedestal is full of loose sand. Water offered during ablution ceremonies percolates underground. It is believed that the water flows underground and joins the tirtha of the Onakkur Bhagawati temple, one and half furlongs away. Apart from the main deity, the temple complex consists of Kizhukkavu Bhagavathy temple, temples for Sastha, Siva, Ganapathi, Nagas and other Upa-Devas. Dharma Sastha shrine is on the north-east side of the main temple. Here he is depicted standing with his consorts, Purna and Pushkala. The vigraha of Sastha is of granite, about half a foot high with golden covering. Legend says that the Sastha accompanied Devi in her The golden flagstaff and altar (balipeedam) are in the front of the Sastha shrine. A platform known as 'Pavazhamallithara', where the deity is believed to have made her first appearance, is on the south of the main temple. Siva shrine is on the south-west. Nearby is the images of Nagas and yakshi can be seen. Kizhukkavu, a shrine to Bhadrakali is outside the main temple on the eastern side. The one-foot granite idol of Bhadrakali facing westward is said to have discovered by Vilvamangalam Swamigal, a saint associated with this shrine. 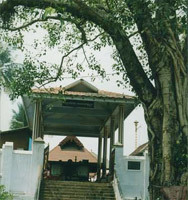 It is said that Vilvamangalam had retrieved the idol from the tank which is in front of the shrine. It is believed that worshipping bhadrakali here will exorcise evil influences, psychological ailments, evil spirits etc from devotees. There is a paala tree on the northeastern side of the kizhukkavu shrine, which is covered with long iron nails hammered on by haunted victims with their foreheads. The practice of driving an iron nail into this paala indicates that the spirit is permanently made immobile. The famous pooja Valiya Guruthy, which means great sacrifice, is performed in kizhukkavu on every night at about 8.45 p.m by the chief priest. Guruthy is a solution prepared out of turmeric and limewater which looks like blood.. It is believed that being present here during this pooja on Fridays permanently cures women suffering from mental abnormalities like schizophrenia. 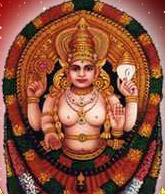 The annual festival (ulsavam)of the temple comes in Kumbham of Malayalam Era. i.e in February- March. It begins with Kodiyettu (Flag hoisting ceremony) on Rohini day, lasts for 7 days and ends on Uthram star. A special feature of the ulsavam is the daily Para ezhunnellippu and Aarattu. Makom Thozhal (Devi darsan) comes during the ulsavam period. It is considered to be most effectual for Mangalyam (long married life) and for getting best marriage for girls. It is believed that Bhagavathy in her full attire, specially decorated with gold and diamonds shine in its entire splendor, gave darsan to Vilwamangalam Swamiyar on the Makom day and appears on the same day every year for giving darsan to the devotees in her special appearance. On that day, the whole temple premises will be over crowded by devotees especially the women folk. Navarathri Aghosham is a famous festival, which attracts large number of devotees. Vidyarambham is conducted on the Vijayadasami day of Navarathri ulsavam. The Vrishchicka Mandala mahotsavam (festival) is celebrated during the entire period of mandalam season. On the makaravilakku day there is lakshadeepam (lighting of one lakh lamps) and fire works. Vazhipaadu or offerings performed in Chottanikkara Bhagavathy Temple are Bhajanam, Annadanam, Chuttuvilakku and Niramala, Rudrabhishekam, Thrikala Pooja, One day Pooja, Mahabhagavath Seva, Noorum Palum, Palpayasam, Mrithyunjaya Homam, Chathussadam, Pantheerayiram pushpanjali, Mandapathilpaattu and Guruthy Vazhipaadu and Poomoodal at Kizhukkavu Bhagavathy Temple. Presently, Chottanikkara Bhagavathy Temple is under the administration of Cochin Devaswom Board. Its historical appeal and traditional influence on generations of people is tremendous. 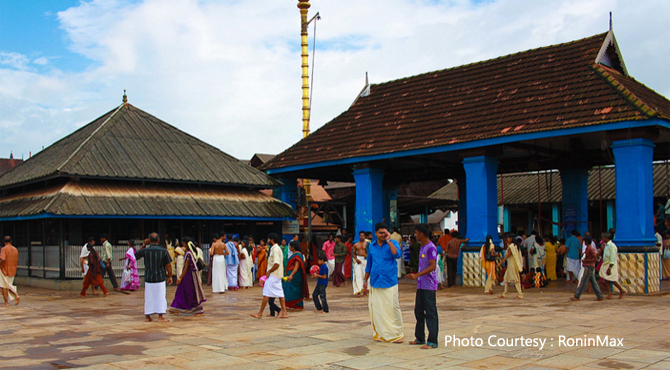 A visit to the Bhagavathy temple brings relief to devotees from the overburdening anguish and agonies of material life. The temple is open from 4:00 in the morning to 12:00 in the noon. It reopens in the evening at 4:00 p.m and closes in the night after the last pujas are performed by 8:00. There is a legend behind the origin of the temple. According to the legend, the place where the temple stands today was once a dense forest inhabited by tribals. Kannappan a ferocious dacoit who dominated this area, brought a cow to his home with the intent of slaughtering it. But the cow escaped into the forest and Kannappan tried to trace it but failed. He returned home disappointed and was surprised to find his beloved only daughter playing with the very same cow. At her request, Kannappan dropped the idea of killing the cow. But some days later his daughter passed away and this shattered him. He lost interest in mundane things and turned his thoughts towards god. One day, Goddess Bhagawati appeared in his dream and revealed that it was she who had come in the form of the cow. She also informed him that the presence of Her idol and that of Vishnu would sanctify the cowshed. The following day, Kannappan found the two images in the cowshed. He built a humble shrine and worshipped the images. Known as 'pavizamallithara', located south of the main temple was the exact place where Kanappan's cowshed and shrine was located. After the death of Kannappan the temple fell in ruins, as the place became uninhabited. One day a pulaya (outcaste) woman who had come to cut grass sharpened her knife against a stone, which started to ooze blood. This was informed to the learned Edathu Nambudiri and he realised that there was divine Chaitanya of Parasakti at the place. Several poojas were performed and a prasnam was held in which it was revealed that the stone be worshipped as Devi and the adjoining one as Vishnu. It then grew into a shrine of the magnitude seen today, over a period of time.